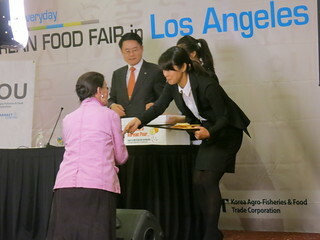 Before checking out the Korean Food Fair trade show, I attended a media conference and lunch. The Korean agriculture department signed a contract with Unified Grocers in the US, and I learned that seaweed is the #1 exported food product of South Korea. 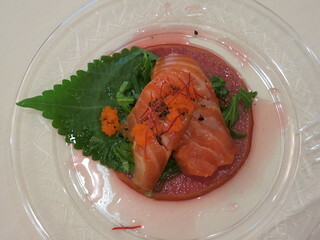 There are three types of fermented food in Korea: kimchi, fermented sauces, and fermented seafood. But these can be used in other types of food. 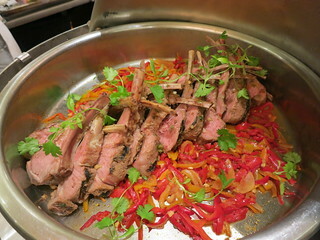 Our lunch made by Chef Myung was half "fusion" - Western style dishes made with Korean ingredients or sauces, while the other half was traditional Korean food. 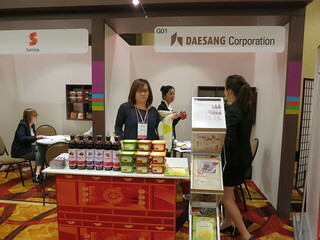 I recently went to the Korean Food Fair trade show. It's a business to business trade show. This trade show was only open to buyers and big retailers, but as media I still got to look around and sampled a bit of what was there. While some brands are already distributed in the US, at least half were products that are still looking for distribution. One of the things I tried and enjoyed was this seaweed snack (laver snack). So, the number one exported product out of South Korea is dried seaweed! 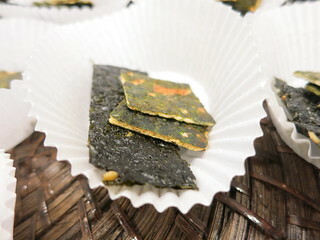 Yet unlike regular seaweed they actually put a thin slice of cracker between seaweed, giving it a crunchier texture that's better for snacking! 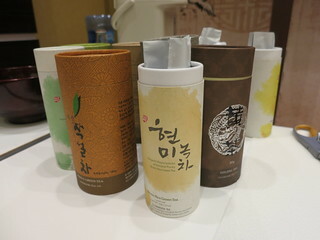 I also like tasting the teas from Hankook Tea. 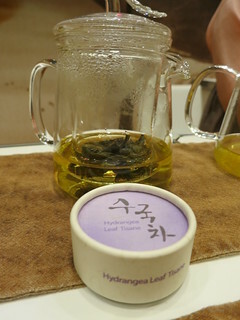 They had things like persimmon tea leaves, and one of the most interesting ones was the hydrangea leaf tea. Because of the container we really saw what was inside the tea, and it really just was the leaves, yet it was surprisingly sweet! There was no sweetener added, hydrangea leaves just contain a substance called phyllodulcin that is naturally sweet. I don't know if this is currently being imported into the US, but I sure hope so! Sure there are an abundance of gastropubs in LA, but you can't say the same of Beverly Hills. In fact, Carson House on Wilshire Blvd may be one of the only ones offering such a big beer selection. I've been to Carson House once for lunch and once for dinner. 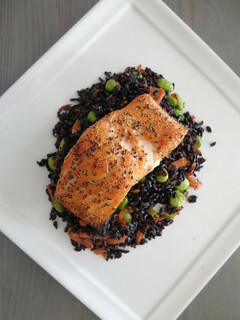 For lunch they serve sandwiches, pizza, and a few entree dishes like this roasted salmon with forbidden rice. Perfect for a nice, healthy lunch. I really liked the combination of flavors here. The feta was not crumbled but served as a whole slice which added to the texture contrast of the salad. 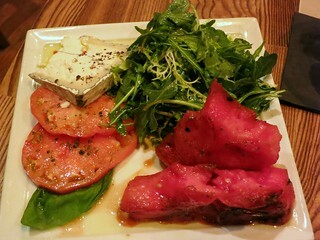 I thought this really distinguished the salad from the usual watermelon feta combo. 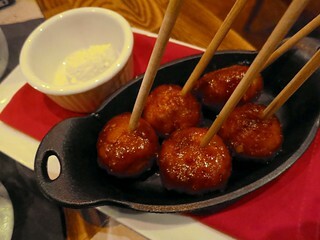 These are a little spicy! Luckily the blue cheese whip is there to curb the spiciness.